Eucerin Aquaphor Soothing Skin Balmcreates the ideal environment to support the recovery process of dry, damaged or irritated skin. It is clinically proven to hydrate and support skin regeneration to aid the recovery of extremely dry, damaged or irritated skin. This water-free, paraffin-based formulation helps the skin by creating the ideal environment. It quickly creates a semi-permeable, protective barrier over the skin which maintains the natural rate of water vapour, thereby keeping the damaged skin moist and supporting regeneration. It is clinically proven to be suitable for use on extremely dry, chapped, cracked or irritated skin caused by a superficial dermatological treatment such as laser therapy, a chemical peel or dermabrasion. 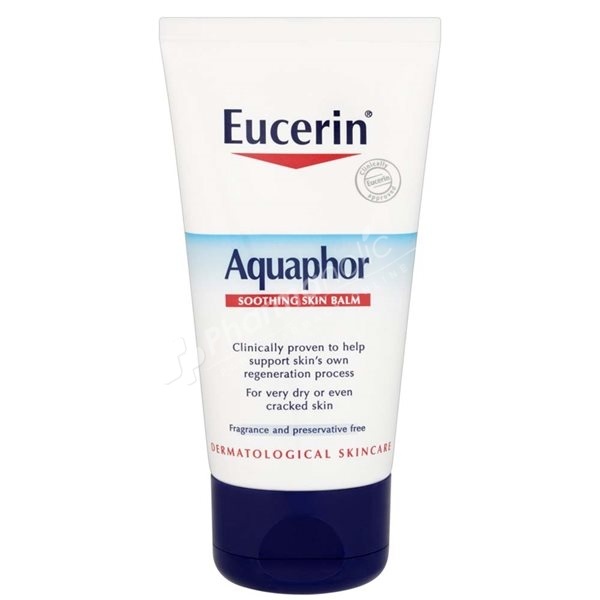 Eucerin Aquaphor Soothing Skin Balm is also suitable for skin care use in Xerosis, occupational dry skin. Eucerin Aquaphor Soothing Skin Balm is mild enough to be safe to use on babies. Apply Eucerin Aquaphor Soothing Skin Balm as frequently as needed on affected areas. Do not use on open, bleeding or wet wounds. Paraffinum liquidum, cera microcristallina, lanolin alcohol, panthenol, glycerin, bisabolol.